Spot on, exactly right and quick too! Goos product, exactly as needed and good price. Very professional anf easy to deal with. Shipped the next day. Onlu hiccup was once the delivery company got involved. They used Yodel who failed to deliver when promised and claimed to post a card through door, etc but I was in and they never turned up at all. Was delivered next day and i raised issue with Yodel as this was definitely not caused by Tyna. Overall good and still arrived in good time. 8 months on and no problems. Father in law very happy. Great service and item. Received the item in good condition ready to use. Reasonably priced battery, good communication from the company and delivered next day. Very please with both the product and service. Delivered on time, works perfectly, gives my wife peace of mind! 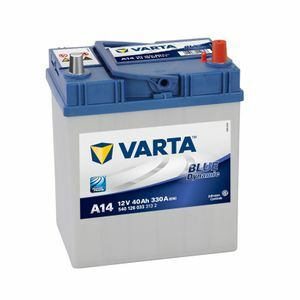 I have had Varta batteries in the past as OEM & replacements and found them to be reliable and very long-lasting products. They are also reasonably priced too. The handle on the top is very handy. Great battery while I had the car, no issues. Service from these guys is great and have just ordered another battery recently, with the same great service. Arrived next day, very well packaged, I bought to replace a Bosch battery, it appears to be the exact same battery with different labelling. This is a good thing as the Bosch battery served me well. It was a toss up between this and a Yuasa battery but this was £10 cheaper and it is their top of the range in this size, it's now been on the car about 1 month with no issues, performing perfectly. I am totally satisfied with the battery and Tayna batteries who supplied it. Easy to DIY fit, took 5 minutes. First class service, price and quality. I will definitely consider Tayna next time I require a battery. Substite for the Bosch S4 018 which was out of stock. Very similar dimensions and seems to work just as well. Alles Prima gelaufen! Schelle Lieferung. Batterie entspricht den Angaben. Excellent fast service. Spot on advice online to select correct battery. Would recommend. Battery is fine, fits perfectly into the car - just a pity that the first battery I was sent was the wrong shape, despite me entering a correct reg no. Replaced the failing Tanya A14 that was already in the car with another Tanya A14 as it had worked without an issue all the time we have had it. Great battery, good price and speedy delivery, what’s not to like? I'm happy with the purchase ! Very fast delivery.